At E3 2017, Nintendo dropped not one, but two major bombs: The first was that Pokemon was making the jump from 3DS to the Nintendo Switch. Not a spin-off, but a full mainline title, presumably the next generation. And also that Metroid would finally be returning with Metroid Prime 4 for the Nintendo Switch. However, Nintendo would not say who was developing the game, only that it was not Retro Studios, the developers of the previous three Metroid Prime games. So the question remained: Who was developing the game? Well, now we have a pretty decent idea thanks to Eurogamer. To summarize, rumors began circulating earlier this week that Bandai Namco was working on Metroid Prime 4, but it was nothing more than that, rumors. However, Eurogamer, who have a fairly proven track record of being right when it comes to all things Nintendo Switch, checked with their own sources, including ones at Bandai Namco, and were able to confirm that yes, Bandai Namco, or more specifically Bandai Namco Singapore, is developing Metroid Prime 4. This revelation was met with mixed reception from what I can tell. Some people are hopeful, others don’t really care, and some already consider the game dead on arrival. And they do have some reason to be skeptical because the last time Nintendo outsourced Metroid to a developer that wasn’t Retro Studios, Other M, it failed hard. But I gotta be honest, I’m in the hopeful camp. Despite the fact that I’ve never actually finished a Metroid game, I still love the Metroid series. And having dug into the expanded materials that turn Samus into something more than a one note badass, it has become one of my favorite series. I see so much potential for larger stories. In the past I’ve written articles and discussed with others what they think makes Metroid, well, Metroid and this often clashes with my views because I hold the “nothing is sacred” viewpoint. I’ll change anything if I think it’ll make something better and I feel like really expanding the scope of the Metroid games to have larger stories, more characters, and yes, a Samus that speaks even if only every so often or as a monologue inside her own head. The key of course is to try and find a happy middle ground where the core of Metroid remains intact, but allows for someone larger to be built upon it, and that’s why I like the idea of letting developers other than Nintendo get a chance. Outside developers are more likely to try and take risks(Not that Nintendo hasn’t taken some risks itself when it comes to its most recent games.) rather than play it safe. 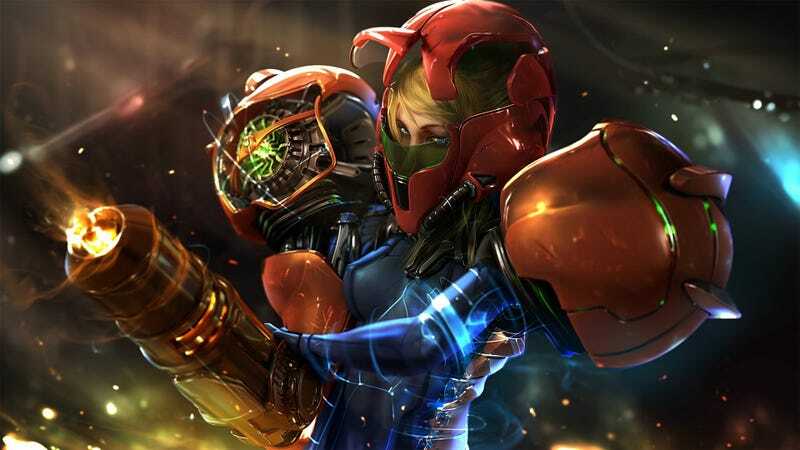 The header image I used for this article is one I use a lot because it shows a deconstruction of Samus, the woman beneath the power armor, a human that’s not a machine or the player. So I’m hopeful that Bandai Namco Singapore will find that perfect balance that allows older fans to come back and be satisfied, and for others such as myself to finally get that game we’ve been craving. Of course, at the end of the day, I just really want more Metroid.